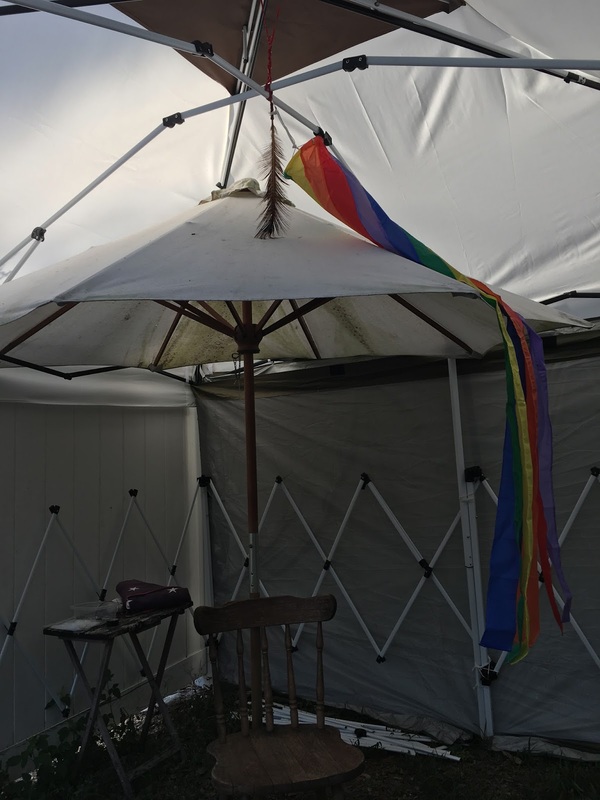 Recently a Storm left three yard tents in total disarray. 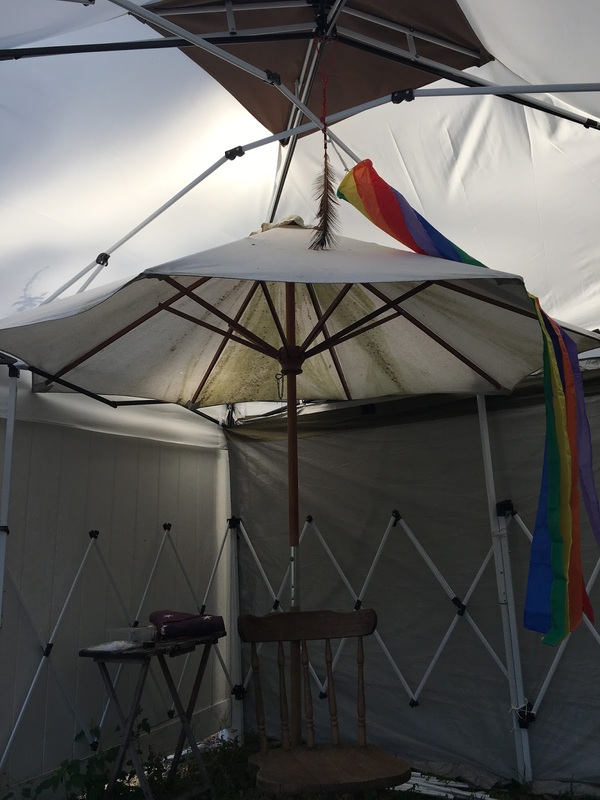 I decided to utilized the broken EZ Pop Up Tent parts to create a garden meditation nook that will withstand Florida Storms for less than fifty dollars, ($50.00). I think i came out stunning! The only expense was the tent roof itself which cost $50.00 with shipping. All three failed from the same problem.. water gathering in the pockets between the corners caused sagging and collapse. Florida gets 2-4" at a time and there is no stopping the pooling water if it comes down fast enough. Then the frame collapses under the weight and wind also. I took all of the tent frame pieces from the white frame tents with brown tops apart and stacked them on the left on the ground in the picture above. I then took the surviving roof from one of the three tents, (brown), and tried to use it as a temporary top until I could find something more suitable. The Brown was much smaller than the original roof on the green tent with black frame that had disintegrated and had a hole in the center of the roof for a Copella of sorts. I made do, as the pictures show. Now here's the part you have to hang with me on. I turned the two white frames from the brown topped tents upside down and then half folded them up creating the outer diamond frame walls of the tent. I then used the extra legs from the broken tents to add extra legs in between the corner posts on the flat walls where the water always gathers, pockets and ruins the tent top. I then extended the former corner angled roof arms up and across the top to meet in the center. 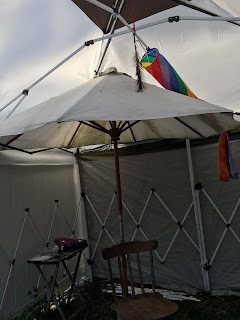 There was a lot of damage to all the joints, but I had enough with the two white tents to get the frame you see fairly assembled with bits and wire and such until I could get a proper roof and then work something else out. It really looked pretty rough, but at this time I really needed the privacy and the project to get me out of the RV and working on a project. I found a top on Amazon and decided to take a chance on it since it was only $50.00 shipped. Even if it was garbage it was light colored and it was reviewed to be a bit big.. which is exactly what I needed to fit my older original 10 year old Gander Mountain frame which was built to freakin' last. This made it bigger than most modern frames and is the reason the white frames were bundled on the ground and the black frame standing naked against the sky after the storm that took shingles off other's trailer roofs and toppled trees. We saw 70 MPH gusting winds that day with micro-downbursts. The tents went down because of water, but the black frame stood it, even though the ten year old roof finally failing to pooled water and Florida Sun. I know I'm going to order another one right away as I don't want to ever have to try to find a new top for at least a decade. This one looks at least like a five year top. Even in the florida sun. Below you'll see the white frame roof members where I crossed and secured them using parts left over from the frames during the storm. If I wouldn't have had the plastic parts I could easily has just used small 1 1/2" long 1/8" bolts and nuts. As you can see in the top picture and also in the final picture, the roof is so big it could probably fit the copella frame entirely. I actually took the only surviving copella frame and top, stuck it up into the roof between the black frame and the canvas peak. I then wired and duc taped it on. I didn't have to do this the picture above shows the roof before the copella. It's not that noticeable and the canvas will shrink in time to reduce that slack even further. It wasn't loose enough to look wrinkled or flappy, the reality being there was room and I had the Copella, so I shoved it up there. It will help reinforce the top in a storm, giving it more support. So Much left to do! I have to decide on a portable flooring that can withstand Florida weather. We are the highest lot on the place and can still have inches of standing water after the Summer monsoons. I also have to have a right angle prefab wall panel to replace the aging tent walls. All of it has to be second hand or surplus material that appears to be new and modern...LOL Love the Challenge! I'm very happy with the progress so far, I have achieved several goals that started this project. I need privacy. I needed a shade spot in my yard. I used all scrap materials and labor was only about a ten hours over three days. 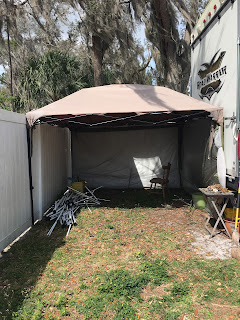 I wanted to salvage the sturdy frame of the Gander Mountain Tent but I didn't want to store it away nor have it naked and abandoned looking in the back yard. I also wanted semi solid walls in my tent and the yurt type diamond metal frames are perfect for adding he feel of a substantial wall without actually having to build one. As someone who once had a drunk stumble through the side of her tent in Sturgis and did not see it coming.. I like to have something besides fabric between me and people. Especially on a blind side. Yeah! About time someone did this!